In 2013, Jordan and Russia agreed on building a $10 billion nuclear power plant, leading to protests from activists, tribes, MPs and scientists in the country. 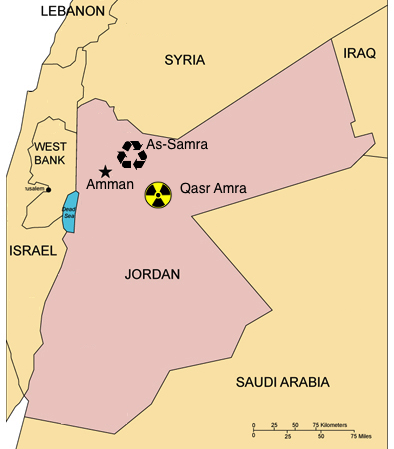 Promises of high foreign investments drive forward Jordan's uranium mining and nuclear plans. More than 95% of Jordan’s energy supply is imported, which comes at a cost of around one-fifth of the Hashemite Kingdom’s entire GDP  and the Energy Ministry expects the country’s total energy demand to grow by 50% and the electricity demand by 74% by 2020 . In addition, the price that Jordan pays for its energy is also unsteady and high due to the instability in the countries from which fossil fuels were traditionally imported. In fact, Jordan used to import subsidized oil from Iraq until the US military intervention in 2003 and then turned to subsidized natural gas from Egypt until the political turmoil in the country made the supply very inconsistent . Since 2007, and in the aim of making Jordan energy independent and an energy exporter, the Jordanian government planned a nuclear program with a capacity of 1000 MW in 2020 which accounts for 6% of the kingdom’s energy demand and with the intention to reach 20% in 2030 . The Jordanian Nuclear Atomic Commission was thus created to be responsible for safety and security, nuclear science and technology, as well as safeguards and verifications . Many sites were evaluated between 2009 and 2014. At first, sites with the option of seawater cooling were examined. JAEC contracted, Tractabel a subsidiary of GdF Suez to study a site 25 Km south of Al-Aqaba and 12 Km east of Al-Aqaba coastline. Later in 2010, Tractabel’s attention turned to Al-Amra, 70 Km north of Amman, for better seismic characteristics, with cooling water coming from a nearby Wastewater Treatment plant. Ultimately, a site in Qusair Amra, a town 70 Km southeast of Amman, was picked . On October 28, 2013, it was announced that a $10 billion deal was struck with Russian firm Rosatom to construct 2 nuclear reactors , with the Russian side contributing 49% of the project’s cost and the Jordanian government with 51% . With the hope that it will be fueled with uranium mined in Jordan . Many activists, energy experts, and parliamentarians protested the deal, pointing at the dangers it poses to the environment and the economy . Authorities, on the other hand, conceded that although atomic energy is not ideal it is the only way for Jordan to solve its energy crisis . In 2012, the parliament voted to suspend Nuclear Energy Planning fearing the negative effects a power plant could have on the environment. Vocal parliamentarian Hind al-Fayez, from the Bani Sakhir tribe (situated near the proposed site) was at the forefront of the opposition to JAEC. Despite the favorable vote, JAEC went through with the project . 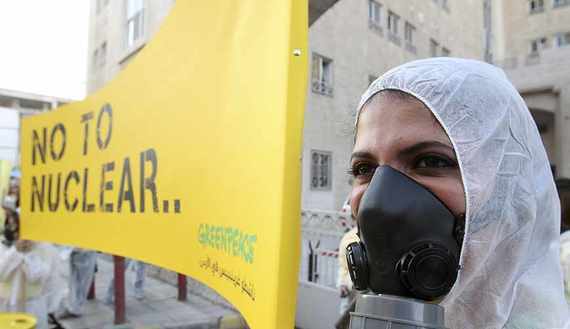 Greenpeace Jordan also criticized the project stating that no environmental assessment was done, the lack of nearby sources for cooling – The proposed source is 70 Km away – and the use of water currently being used for irrigation and agriculture. In fact, with 135 m3 of water per capita, Jordan is the fourth water-poor country in the world . The site for the planned reactors, meanwhile, sits directly atop the Azraq aquifer, a major source of freshwater for the Jordanian capital. Environmentalists warn that one accident may instantly poison up to one-third of the country’s water networks . Moreover, and despite not having started construction, Greenpeace claims the project already depleted hundreds of millions of dollars which could have been invested in renewable energy . A group of 5,000 young men formed the “Bani Sakher Awakening” group which launched a series of civil disobedience campaigns to prevent construction crews of reaching the site. Tribesmen, farmers and environmental activists, former nuclear engineers and MPs often gather in Qusair Amra in anti-nuclear meetings stating they are protecting the area’s rich historical and cultural past, its environment and its future . As of April 2014, the country recorded a $2.8 billion budget deficit prompting the government to take several austerity measures like removing flour and fuel subsidies. According to activists, nuclear costs will be too much of a burden on a country already dependent on aid and with calls for the development of solar energy multiplying . 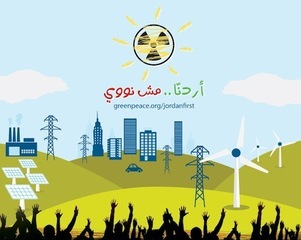 In order to keep the pressure, sit-ins in front of the Energy Ministry, conferences and other events are being regularly organized by the Nuclear Free Jordan collective which seeks to highlight the unsustainability of nuclear energy and its detrimental effects . In a final disagreement, both sides claim they are winning the fight. Kawwar, a parliamentarian, says opposition to the nuclear program is building in the halls of power, as decision makers realize they have been misinformed about nuclear energy’s costs and benefits. JAEC officials say that everything is on track. On August 20, 2016the (JAEC) said that Jordan’s first nuclear power plant could be operational by 2025 if sufficient financing is secured . Project Details With desert covering 92 percent of its territory, the kingdom is one of the world's 10 driest countries and wants to use atomic energy to fire desalination plants to overcome its crippling water shortage. Jordan is thought to have significant uranium reserves and has struck deals over the years with foreign firms to mine for uranium in its central region, while also considering building a nuclear power plant. The current plan includes two 1000 MW nuclear power units. 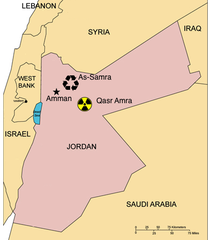 In 2007, Jordan announced its plans to start a national nuclear power programme using its uranium deposits. Since then, it has attracted a number of foreign investors for cooperation on uranium extraction. Most notable states involved are France, Japan, United Kingdom, Australia, and, most recently Kingdom of Saudi Arabia. KSA is currently a heavy investor, setting up a a multi-billion dollar fund in 2017 for uranium extraction, water desalination, and energy projects in Jordan. 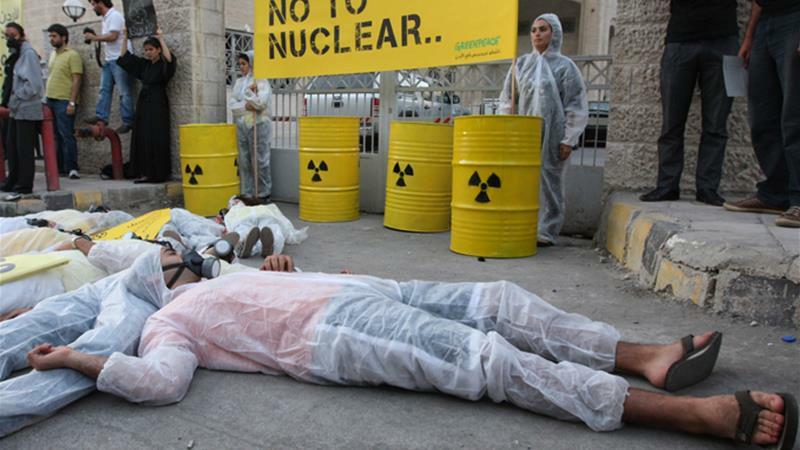 Jordanian environmental activists have long opposed the state's nuclear plans due to their environmental impacts. In 2012, parliamentary deputies issued a moratorium on the nuclear programme, that was subsequently violated by the state. There is a plan for mining 300-400 metric tonnes per year of Uranium. As in the United Arab Emirantes and in Saudi Arabia, much emphasis is made in the use of nuclear power for water desalination. In 2015 it was prematurely announced that Jordan had signed a $10bn deal with Russia to build the kingdom's first nuclear power plant, with two 1,000-megawatt reactors in the country's north. The violence in neighbouring Iraq and Egypt's Sinai Peninsula has threatened and in many cases, completely cut off electricity supplies in Jordan. According to the state's Petra news agency, Jordan plans to finish construction of the plant in Amra by 2022. . The deal was signed with Russia's state-owned Rosatom company. After years of discussions and negotiations with several countries and companies, it was reported in 2017 that Saudi Arabia was to set up a US$ 3 billion joint investment fund for Jordan, among 15 cooperation agreements signed by King Salman during a visit to Amman. Agreements include measures to boost power generation, tackle worsening water shortages, and improve housing and health services, Jordan's official Petra news agency said. It said the accords covered uranium mining and water desalination projects, and that a memorandum was signed to build a 70 million solar power station on Jordan's eastern border. Development of Alternatives Environmental Activists mainly call for the development of renewable energy, mainly wind and solar. They completely reject the construction of a Nuclear Power Plant anywhere in Jordan. Abandon nuclear energy in favor of safer less water-intensive renewable energy sources. Why? Explain briefly. Both sides claim they are winning the fight. Kawwar, a parliamentarian, says opposition to the nuclear program is building in the halls of power, as decision makers realize they have been misinformed about nuclear energy’s costs and benefits. JAEC officials say that everything is on track. Perhaps activists and MPs lack leverage against state-level multi-billion dollar cooperation deals and a drive by mining companies to exploit Jordan's uranium deposits. New Uranium Mining Projects - Jordan] A timeline by the World Information Service on Energy (WISE) Uranium Project documenting all news entries about Jordan's uranium mining and nuclear power plans. Worley Parsons. Jordan Atomic Energy Commission (2009). White Paper on Nuclear Energy in Jordan.